This tent is spacious, waterproof and durable. 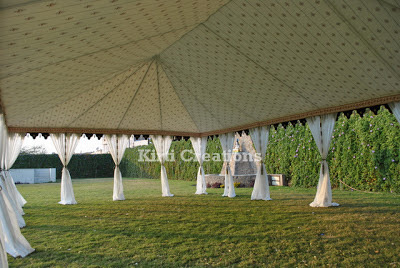 Its interior decoration of this garden tents is awesome. 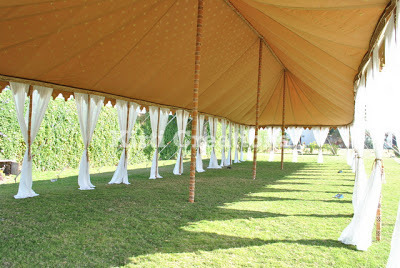 This tent is suited for large and grand parties. 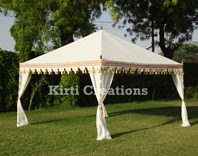 This tent stands itself in fabulous design of border and hut shape. 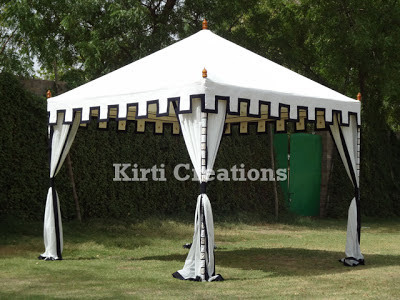 This garden tent is ideal for huge parties and can stand itself in any kind of weather. It is waterproof and ideal for medium size of parties and it is easily assembled and dissembled from anywhere. 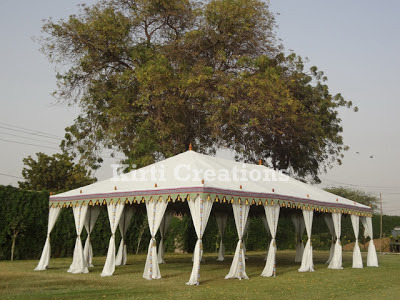 We provide you designer garden tent in various pattern and in various color. 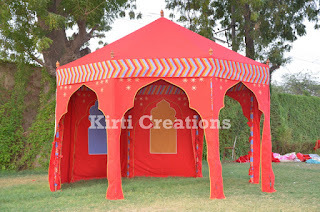 The roof of this raj tent is design in white and pink color and its curtains is in yellow and red color which give the dazzling touch in the tent. 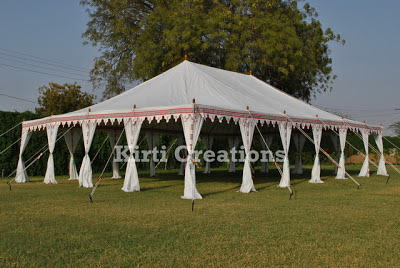 We assemble the elegant garden tent which is accommodated large number of people, its eye catching look i.e. white canvas with beautiful border. Assembling and disassembling is easy of this tent. Luxury Garden Tent is easily assembled in the garden and can be accommodated large number of people. 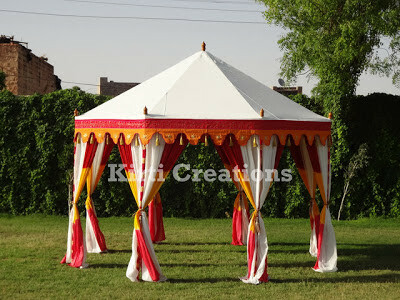 We made this tent with fabulous color combination of canvas with the use of waterproof fabric. This tent seems to be one long luxury tent and this tent is usually arranged in a series.It is easy to set up. 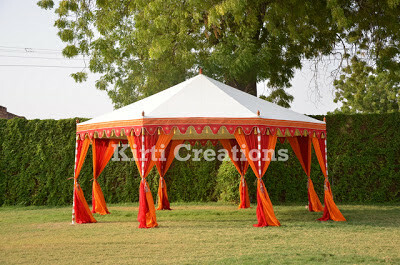 An apprised and ostentatious tent with multiple colors of cloths leaves a great impression on the guests. 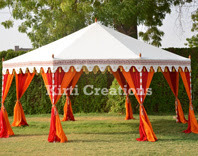 This raj tent bears a magnetic and picturesque appeal. The tent is designed with attractive and separate inner and outer view. 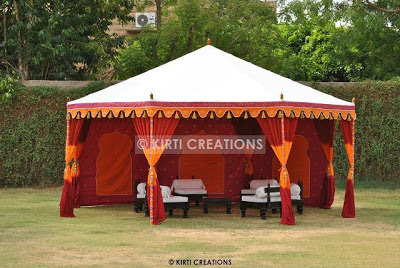 This luxury raj tent is comfortable and easy to set up on ground. The curtains of this tent are made of silk and known for its various color combination. This tent is completely waterproof and boisterous enough to bear the rough weather. 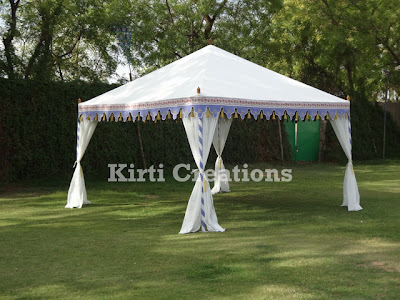 This is very elegant medium sized raj tent and its look is simple but attractive. 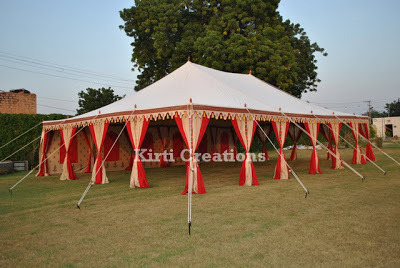 A nicely and beautifully designed Luxury tent with a pointed top and all sides open. This tent can be assembled and disassembled easily. 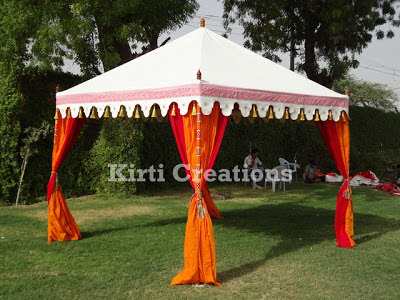 This raj tent stand as a simple tent but it attracts people through its simple look it is light in weight and easily placed in garden or park. This tent is very effective and aesthetically fabricated. It provides shelter over a wide area and presents an admirable or charming style. A wide open Luxury tent is suitable for hosting grand lunch or dinner. This tent can be quickly placed anywhere and does not take time while it is assemble or dissemble. It stands as elegant Luxury tent with plain exterior and designer interior portion and it is waterproof also.